Something very interesting on not so good looking animal ~ gleaned from various sources on the net. It was in 2007, 14 years after Escobar's death, that people in rural Antioquia, 200 miles north-west of Bogota, began phoning the Ministry of Environment to report sightings of a peculiar animal. It was stated that ‘they found a creature in a river that they had never seen before, with small ears and a really big mouth." –startling for the villagers for it was not native to that place…. Situated halfway between the city of Medellin and Bogota, the Colombian capital, Hacienda Napoles was the vast ranch owned by the drugs baron Pablo Escobar. The estate covers about 20 km2 (7.7 sq mi) of land. In the early 1980s, after Escobar had become rich but before he had started the campaign of assassinations and bombings that was to almost tear Colombia apart, he built himself a zoo. He smuggled in elephants, giraffes and other exotic animals, among them four of these - three females and one male. And with a typically grand gesture, he allowed the public to wander freely around the zoo. Buses filled with schoolchildren passed under a replica of the propeller plane that carried Escobar's first US-bound shipments of cocaine. The animals now vast in number and fully grown are dangerous. Despite their ungainly appearance, they are very agile in the water and can charge on land at up to 18 mph (29km/h). It's often said that they are responsible for more human deaths in Africa than any other animal - though it may be more accurate to say they cause more deaths than any other wild mammal. Attacks happen when humans encroach their territory – they are not crocodiles – not instinctive killers, nor man-eaters. Yet living near the animals is inevitably a risk, - one that local people have to decide whether they are willing to take. Pablo Emilio Escobar Gavíria (1949 – 1993) was a notorious and wealthy Colombian drug lord and an exclusive cocaine trafficker. He is regarded as the wealthiest criminals. In 1975, Escobar started developing his cocaine operation. He even flew a plane himself several times, mainly between Colombia and Panama, to smuggle a load into the United States. Reports state that he later bought fifteen new and bigger airplanes (including a Learjet) and six helicopters, he decommissioned the plane and hung it above the gate to his ranch at Hacienda Napoles. The war against Escobar ended on December 2, 1993, when Colombian National Police assisted by Colombian electronic surveillance team, using radio-triangulation technology, found him hiding in a middle-class barrio in Medellín and shot him dead. The Robin Hood image that he had cultivated continued to have lasting influence in Medellín. Following Escobar's death in 1993, his family went into a legal struggle with the Colombian government over the property. The government prevailed and the neglected property is now managed by the Municipality of Puerto Triunfo. The cost of maintenance for the zoo and the animals was too expensive for the government, so it was decided that most of the animals would be donated to Colombian and international zoos. There still are bison, zebras, a rare goat and one ostrich. The one talked about in earlier paras - Escobar's hippopotamuses became feral, living in at least four lakes in the area and spreading into neighbouring rivers. Some are misnomers ~ the not so good looking hippopotamus (Hippopotamus amphibius), or hippo, from the ancient Greek for "river horse" is a large herbivorous mammal in sub-Saharan Africa. After the elephant and rhinoceros, the hippopotamus is the third largest land mammal. The hippos once owned by drug kingpin Pablo Escobar run riot in the Colombian countryside and could not be relocated to Zoos because of the sheer size of its population. Thus in an unlike Country, around 200 miles of the capital Bogota, hippos roam free, and cause problems for the local community. Some families have even taken in hippo calves and nursed them at home as pets, according to El Colombiano newspaper. However, despite a fence supposedly keeping them within the grounds, there have been increasing reports of the hippos bypassing the boundary and venturing into the surrounding area. Despite not being native to Colombia, the hippos are thriving, with females giving birth on average to a calf a year - higher than the average in Africa. In trigonometry and geometry, triangulation is the process of determining the location of a point by measuring angles to it from known points at either end of a fixed baseline. This technique was reportedly used for locating and eliminating the dreaded drug lord. 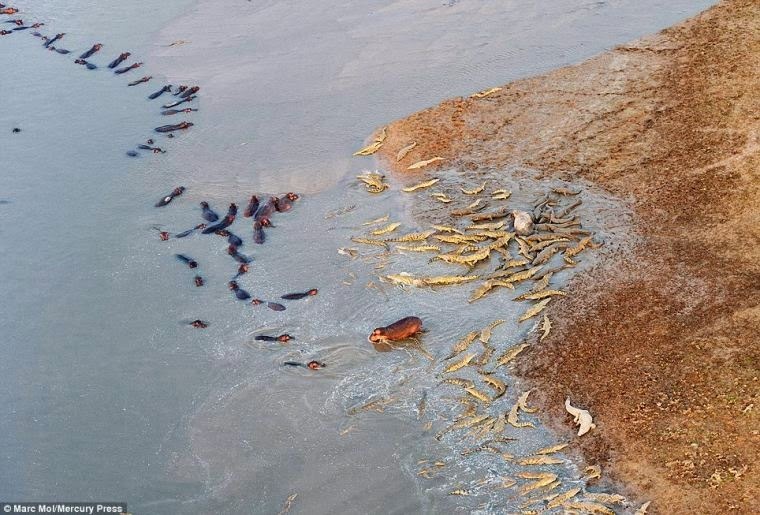 PS : photo credit : Daily Mail… this is not a photo of Escobar's hippos - taken from an earlier article - have never seen even in photos so many hippos and crocs .. had always imagined that hippos would roam in small nos.